Miller Electric Mfg. Co., has announced the launch of the new Maxstar 161 welding power source. The machine provides lightweight portability, ease of setup and use, and improved performance for a variety of light industrial applications. With three different models available, the Maxstar 161 S/STL/STH delivers up to 160 amps of welding power for stick and TIG applications. At just 13 lbs, the compact, lightweight machine also provides the portability that is critical on the jobsite and in many shops. An upgraded handle/shoulder strap allows the operator to easily move the machine from location to location. A new digital meter on the Maxstar 161 results in easy machine setup and more precise control when presetting or monitoring welding amperage, while a single amperage range allows welding operators to accurately set amperage on both 120 or 240 volt primary power. The Maxstar 161 includes improvements that provide superior stick arc performance, allowing welding operators to keep the arc lit, even on difficult to run electrodes such as E6010. Using Miller Stick-Stuck technology, the machine detects if the electrode is stuck to the part and turns the welding output off to safely and easily remove the electrode. The Maxstar 161 S is a stick-only welding power source designed for use in maintenance repair, shipboard installation and repair, farm and ranch, and hobbyist applications. This model offers DC output stick welding with an amperage range of 20 - 90 amps on 120 volt primary power and a range of 20 - 160 amps on 240 volt primary power. The Maxstar 161 STL offers Lift-Arc™ TIG and stick welding processes for light industrial applications and a variety of industries, such as process pipe, dairy, food and beverage, restaurant and kitchen repair, and maintenance repair. This model offers DC TIG up to 130 amps and DC stick up to 90 amps on 120 volt input power, and DC TIG and DC stick up to 160 amps at 240 volt input power. 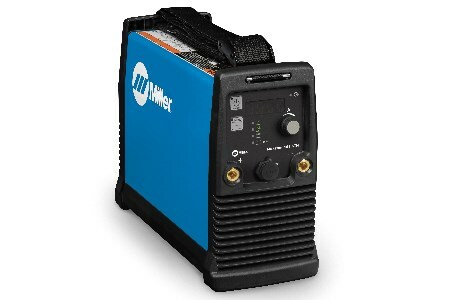 The Maxstar 161 STH power source offers TIG, pulsed TIG and stick welding for light industrial applications, providing DC TIG up to 130 amps and DC stick up to 90 amps at 120 volt input power and DC TIG and DC stick up to 160 amps on 240 volt input power. The pulsed TIG process on this model offers a range of 0 - 150 Hz, for improved arc stability and heat control that help increase travel speeds and reduce distortion. All three models also feature Auto-Line™ technology for both 120 and 240 volt input power, a power management technology that frees operators from primary power limitations and allows uninterrupted production, eliminating concerns about dirty power.